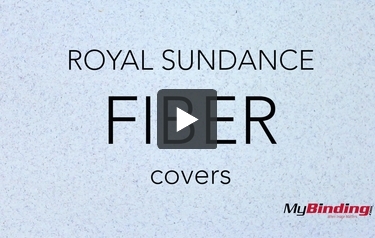 These kraft Royal Fiber covers are designed to look great both in plain and printed applications. The kraft Royal Fiber covers include a blend of fiber and flecks that provide a unique look and feel to your reports and presentations. Boasting a smooth finish, kraft fiber covers are manufactured by Neenah Paper---meaning they're acid free, lignin free, and "Green Seal" certified to contain at least 30% recycled materials. With over 150 fiber covers to choose from, it might be a challenge just choosing one! We also offer these kraft fiber covers pre-punched for use with the binding system of your choice (see list below).